When I select a large number of files, and want to get information about all if them together as a single selection, such as the combined total size, I get the same window for every individual selection, and not a single view for the selection as a whole. How can I get total file sizes for file/folder selections? Cmd+Ctrl+I does something similar, but gives you a static Summary Info window which doesn't update as your selection changes, and you can open multiple windows for different selections, which is handy for comparing groups of synced folders for example. 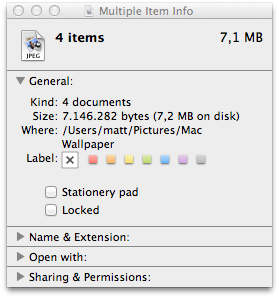 How can I make all folders in Finder “snap to grid”? How do I Get Info for multiple items in one window? How to close all Finder inspector windows?